Thanks so much for the review. I had a really fun time writing this one, and of course, collaborating with Jeffrey and Jen (as well as Jon Marr, Daniel Bishop and several other community favorites) is what really makes this all worthwhile. I owe you a tasty lunch of chicken wings! You forgot to list how one can acquire Jobe’s self published adventure. Good catch. Drop a line to theband@spellburn.com and we’ll nudge you his way. Thanks for taking the time to review Prayers of the Forgotten, The Wizardarium of Calibraxis, and The Stronghold of the Wood Giant Shaman. What’s great about your reviews is that you give both the pros and the cons of the products, allowing the publishers to improve future offerings. Reviews like these also introduce people to micro-publishers and thus help grow and maintain the wonderful DCCRPG community. I think Jeffrey will be pleased to hear that our next 40 pg. 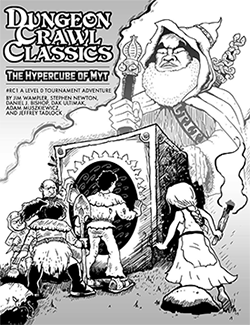 adventure, The Treasure Vaults of Zadabad, has a bunch of art from the talented illustrator Todd McGowan.